Situated in the heart of Savannah’s historic district, The DeSoto has a storied 125-year history. Having hosted celebrities, dignitaries, authors, and presidents, the original DeSoto was built in 1890 on the site of Oglethorpe’s Barracks and was the town’s unremitted purveyor of hospitality. The hotel’s current structure, completed in 1968, stands as one of the Historic District’s leading full-service hotels, providing the perfect setting for leisure, business, and conference guests. 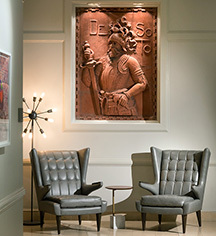 An area in the hotel is dedicated to the history of The DeSoto, affording guests a glimpse of the hotel’s past. The original 1890 crystal chandeliers, once described as “sparkling clusters,” still shine brilliantly in the hotel’s lobby. Located in one of the country's largest Historic Landmark Districts, The DeSoto is situated in the heart of Savannah's historic shopping, dining, and theater district, just a short stroll to the River Front and City Market. 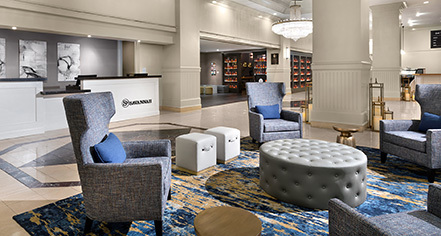 Surrounded by landscaped gardens and squares, magnificent Southern homes, and architectural gems, this contemporary hotel in the Savannah Historic District is the perfect place to start exploring this coastal city. The DeSoto, a member of Historic Hotels of America since 2017, dates back to 1890. The DeSoto was one of the country's finest hotels and was often referred to as the "Dowager Empress of the South." Early Check-In/Late Check-Out: Early Check-In: Available. One can be requested; however, we cannot promise that it will be fulfilled. That will be passed on the occupancy level of the hotel the night before. Late Check-Out: Between 1pm-3pm $90.00; after 3pm full rate applies. Hotel/Resort Fees & Taxes: Reservations are subject to a 7% State tax, 6% City tax. Parking: Self-parking: Not Available. Valet: $30.00 (In/Out privileges). Secured: Available. Covered: Available. Other Parking Information: Oversized vehicles require special arrangements. Payment: All forms of payment are accepted. Payment is required at time of booking. Visa, MasterCard, Amex, Banamex, Bancomer, Bankamericard, Carte Blanche, China Union Pay, Choice, Diners Club, Interbank, JAL, JCB, and Discover are accepted. Pet Policy: Service animals allowed: Yes (must have paperwork). Pets allowed: No. Rollaways: Available upon request; surcharge $25. Learn more about the History of The DeSoto .